What is the 20th Object…? The Old Treasury Building, of course! The volume of gold found in the first few years of the gold rush was staggering – some six million ounces was brought to Melbourne between 1853 and 1857. 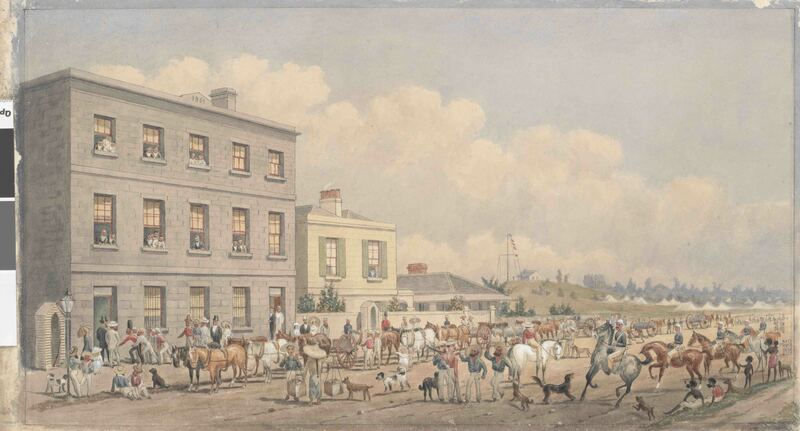 Soon all the strong rooms were full and in 1857 a new government treasury building was commissioned to store the gold. The opportunity to design it was given to a talented young government draftsman – nineteen year old John James Clark. The ‘New’ Treasury Building was built between 1857 and 1862. Sturdy vaults were constructed in the basement of the building, with opulent offices for important government officials above. But by the time of its completion the rate of gold discovery had slowed. We don’t know how much gold was ever stored in the vaults. The Old Treasury Building is one of Australia’s finest nineteenth century public buildings. It is one of a suite of splendid public buildings, built with the proceeds of gold, that began the transformation of the small colonial town into the cosmopolitan city later described as ‘Marvellous Melbourne’. John James Clark began his design for the Treasury Building in 1857. After a study tour of Britain and Europe, he drew inspiration from classical architecture, the Italian Renaissance and trends in nineteenth century revivalism. The resulting mix is described as Renaissance Revival style in the Italian palazzo form. 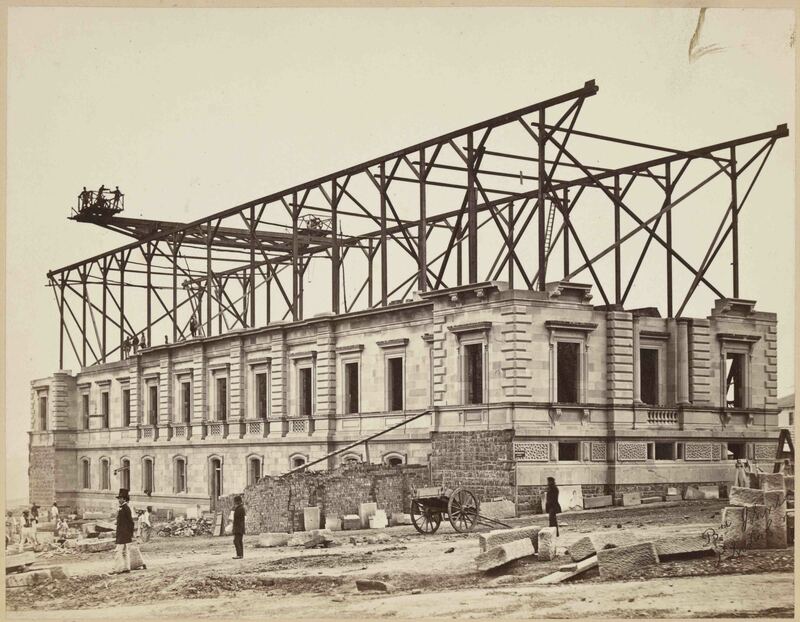 The first contracts for the building were signed in 1858 and builder Robert Huckson began construction. Although the building was largely completed in 1862, the external staircases, approaches and lamps were not added until 1867. The total cost of the building was about £75,000- a fortune by nineteenth century standards. It was a building intended to impress! 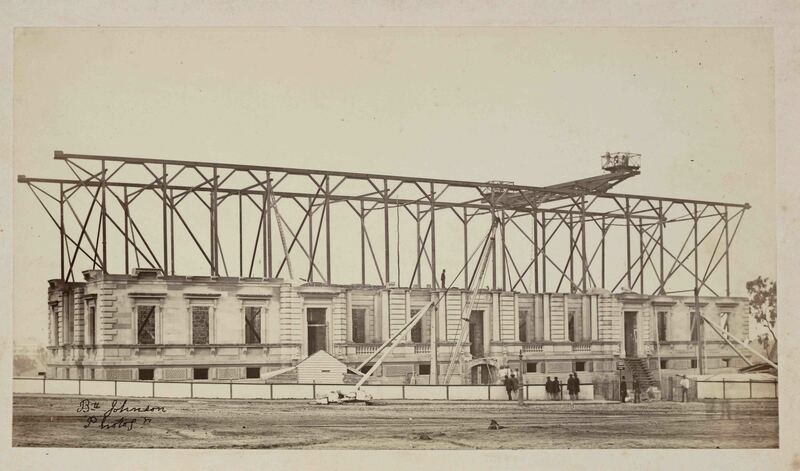 The Treasury building under construction, circa 1858, viewed from the north-east, looking to the rear of the building. The travelling crane was relatively new technology.